Matt Taylor '16 made his 100th career hit a memorable one as he crushed a double to left field in the bottom of the seventh inning, then scored on a double by George Stiuso '16 to tie the game at five against visiting Bound Brook High School on Tuesday. Scoring the game winning run was A.J. Donofrio '19 on a bases-loaded walk by James Raia '16 in the bottom of the ninth as the boys captured the Skyland Conference Mountain Division championship for the second consecutive year. 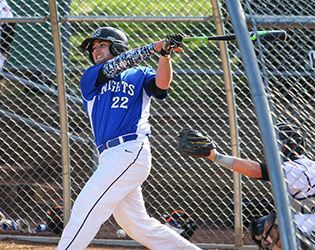 Danny Sivolella '16 chipped in with three hits and Ryan Chestnutt '16 lined a two-run double to help GSB Baseball improve to 14 and 6 on the season. Next up for the Knights is the Prep B Tournament, which opens with a quarterfinal round game against Newark Academy on Friday.